The List menu lets you display other colors. Check the adjacent squares then click on the panel or outside : the selected colors will then appear in the list. Two options are available in the bottom of the color list. If you click on All, all of the Color groups will be displayed. You will then have access to all of the tints and their functions. 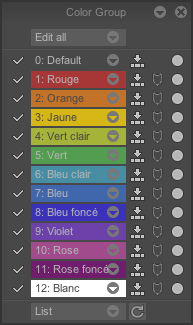 This can be useful when you want to select a few colors after having displayed all of them. You can also click on Refresh ( ) to update the list, instead of checking the colors one after the other.